As well as web design, we can compose and produce professional sounding tracks for your website (or even for another use), whether it be a short clip (like our introduction) or a longer track playing at all times we can produce it to suit your needs. 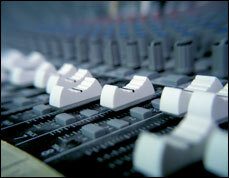 We can feel confident we can write almost any style of music you require. We use professional software such as Cubase and Wavelab along with high quality sound modules such as the Roland JV-2080 and the Novation A-Station. The final product can be either on CD, put directly onto your website or both. When we convert the track for use for your site we will need to lower the quality because the sound must be compressed to try and make the page accessible to people viewing your site. Atmospheric - This clip is an example of some strange atmospheric music. Atmospheric 2 - This song uses only General Midi instruments (recorded on a Roland Sound Canvas). Nebulous - This recent clip shows demostrates what kind of dance music we can produce. Our Web Design Packages - View information about our UK web design and development packages on offer.